As previously mentioned, we’re focusing on ways to make your home warm and cozy for fall and winter. With the holidays approaching, odds are good that you’ll be hosting houseguests sometime in the next few months. If you’re worried about the state of your house, we hope this post will give you some great inspiration for creating cozy bedrooms and wonderful spaces that will keep your guests hoping for another invite! 1. The Bed. One of the most important things guests will want while they stay with you is a comfortable place to sleep! So start with the bed to create a fabulous guest space. Make sure that you launder your sheets and comforters or blankets before guests arrive. Did you know that you can use Eucalan in your washing machine? Be sure to set the temperature to cold or tepid water, and add Eucalan to the machine, then wash as normal! We recommend drying away from heat and direct sunlight, so you can tumble dry on low or air dry. If you have comforters or handmade quilts, you can also wash those in the washer, just make sure you select the delicate cycle and cool water, and you’re all set. If you have wool blankets for your guest bedroom, we have a great tutorial on washing wool blankets with Eucalan. And of course, you have your choice of Eucalan scents so everything will smell amazing and clean! If you’re looking for bedding inspiration, we love everything Stone Gable does to create her guest rooms! 2. The Bathroom. Of course your guests will need a fresh, clean bathroom during their stay. Whether the bathroom is only theirs to use, or shared across the household, make sure you stock it with everything they will need. You can launder towels (bath, hand and washcloths) ahead of time in the washer with Eucalan to make them clean, fluffy and oh so fresh! Make sure you place them somewhere accessible to your guests so they don’t even have to ask. You should also stock the guest bathroom area with plenty of toilet paper, sample shampoos, conditioners and lotions, and spare items they may have forgotten like toothbrushes, toothpaste and floss. You can also add a small selection of other items: mending kits, analgesics or other over the counter medications, hair bands, mouthwash, etc. 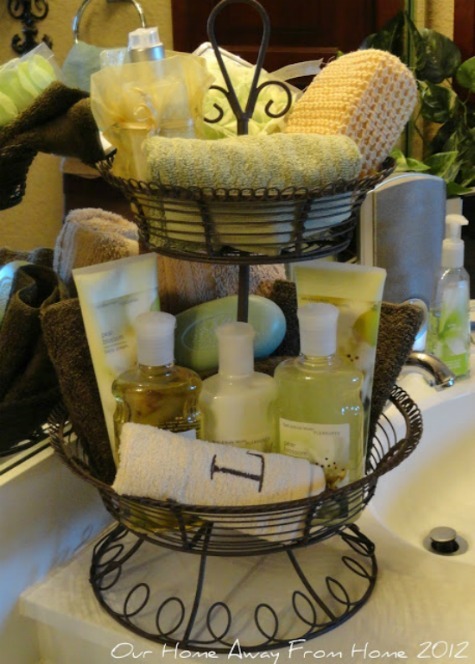 We love this cute tiered basket from Our Home Away from Home. 3. The Light. Make sure your guest bedroom and bathroom are appropriately lit. There’s nothing worse than creating a space that’s either overly dark or too bright. Add bedside lamps with natural light bulbs to allow your guests to set the light levels in the room. If the guest room has windows, make sure there are drapes or window treatments for privacy, but also open them to let light in during the day. We love the simple bedside table setup from Driven by Decor. 4. The Blankets and Pillows. Make sure your guests are cozy and warm and accessorize your guest room space by adding extra blankets and throws to the room. Pile pillows on the bed to make a cozy nest for your guests to retreat to! Here is where you can add your own favorite colors or style to the room. If you’re a knitter or crocheter, why not add a cozy blanket you’ve created? If you’re a quilter, add a quilt you’ve sewn. We love this cozy looking bed from oh.eight.oh.nine. 5. The Storage. When your guests arrive with their suitcases and and bags, they’re going to need a place to store them. Invest in a simple luggage rack which you can place at the end of the bed or in the closet to hold suitcases or bags. And don’t forget about the closet! While most of us use the guest bedroom closet as storage space, try and keep a small area clear for guests to hang their clothes, along with a few free hangers. If you want to up your game, add bathrobes or other cozy items to the closet as an unexpected surprise! If there’s no existing closet in your space (or it’s packed) you can always add a small armoire to create extra storage space. 6. The Flowers. Adding fresh flowers or greenery to a room instantly brightens it up with fresh life. Choose seasonally appropriate flowers and make a small bouquet for the bedside table. A small vase with just a few buds will do and add a nice touch that shows you spent time making the guest room a special place for your guests. We can’t get over how this arrangement of mums in Stone Gable’s fall bedroom makes everything glow! 7. The Final Touches. Once you’ve got the basics of your guest space covered, now it’s time to add the little touches that allow you to share your personal style with your guests. Perhaps you want to add a small welcome tray to the bed, stocked with water, charging cables and other goodies? Or add a small framed sign with the Wi-Fi password to give your guests easy access to the internet. Add books or magazines that might be of interest to your guests for a little light reading before bed. Add picture frames or handmade crafts for a homey touch, or yummy smelling candles to add warm cozy scents and a bit of light. We hope you’ve enjoyed these tips on creating warm, wonderful spaces for your guests this holiday season! This quarter, as the weather turns colder and we spend more time indoors, we’re focusing on ways to make your house a warm and cozy place to be. We fell in love with this recent project tutorial created by Brown Sheep Company, and it turns out that they are fans of Eucalan, so they generously agreed to let us share it with you here on our blog. This is one of those crafty projects that can instantly warm up the walls in a room and is so customizable it can match any color scheme and decor – plus, you don’t need to know how to knit and crochet! When preparing your yarns for this project, go ahead and give them a quick bath in Eucalan, and you can use Eucalan to spot treat your wall hanging in the future should it need a quick freshening up. Without further ado, we give you the Brown Sheep Easy DIY Fringe Wall Hanging With Pom Poms. The fall fringe trend doesn’t have to be limited to garments and accessories! Today, we’ll show you how to make a modern wall hanging to add a handmade touch to any room using a few skeins of Lamb’s Pride bulky and worsted yarn – no knitting or crocheting required! We recommend washing each of these lengths before proceeding to the next step using your favourite scent of Eucalan wool wash – this will remove any kinks in the yarn resulting from being in the skein, and it will also allow them to plump up a bit. If you are pressed for time, try using a hand held fabric steamer for this step. Whichever option you choose, make sure your yarn lengths are completely dry before continuing. This is where you will begin attaching fringe; to do so, simply fold the length of yarn in half and create a loop, then pull the tail ends around the dowel rod and through the loop, tugging them gently and evenly to secure. Starting at the center, attach all 5 lengths of the 44″ fringe. You may need to trim some of the ends to even them up, but keep in mind that they don’t need to be absolutely perfect – a little variation will just add texture! From now on, you’ll be attaching half of each set of yarn lengths on either side of the fringe on your dowel rod. Continue adding each length of fringe, from longest to shortest, to your dowel rod, working from the center. You will attach 3 each from the 40″, 35″, 20, and 25″ lengths on either side of your center fringe, and 4 each from the 20″ lengths at each end of the dowel rod. Next, make your pom poms! You can make as few or as many as you like; for the wall hanging shown here, we created one 5.5cm and two 3.5cm pom poms with our contrasting yarn and attached them to the center like so (you may need to trim some of the yarn ends from your pom so that they don’t show through the fringe when hung on the wall). For our second wall hanging, we created a garland with one 5.5cm pom pom in the center and three 3.5cm pom poms on either side, which we then attached to the dowel rod. Play around to see what you like best! Finally, cut a 20″ length of worsted weight yarn and tie to either end of your dowel rod. Hang and enjoy!